My wife and I are currently enthralled with the PBS television series, Downtown Abbey. It is a series about an extremely rich English family at the turn of the century. We are currently watching Season 3. The story is multi-generational, but centers on the Earl of Downton, his wife and mother, and their three daughters. Of course, the entire servant staffs’ stories are intertwined with the upper class, and one daughter even runs away with the chauffeur. The stories about the daughters are not those of a randy bunch of girls, but are told in a realistic and sensitive way. You get into the whole turn-of-the-century English Lord and Lady thing. It is very entertaining. The unspoken star of the series is the house, itself. The actual structure used is Highclere Castle, a famous and picturesque castle in its own right. 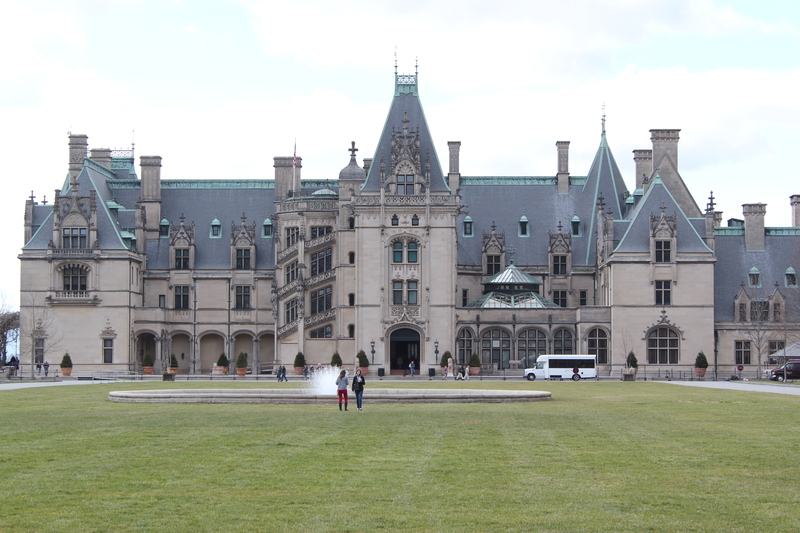 This last week, we made the trip to Asheville, North Carolina and visited the Biltmore House. This is the house built by George Washington Vanderbilt II, grand-son of the fabulously wealthy shipping magnate, Cornelius Vanderbilt. G W received about $2 million after granddad’s death in 1877, equivalent to almost $40 million in today’s dollars. The Biltmore estate was originally composed of 125,000 acres in the Smokey Mountains of North Carolina. It is only about 8,000 acres today. There is the Biltmore House itself, a winery, several gardens, and other attractions on the grounds. Having consumed a couple of bottles of their house brand of wine since the visit, I can say that the wine is generally good. Specifically, the Pinot Grigi0 and Cabernet Blanc are good, and the Cabernet Sauvignon is drinkable. The prices ran about $15 to $20 per bottle, which was a bit high for the quality received. On the other hand, what do you expect from a tourist operation like the Biltmore House? Certainly, many of the visitors know about wines, but I have a suspicion that many do not. It certainly seems to me that they could profitably operate a whiskey distillery, or at least a brew pub. The laws in North Carolina may prohibit those activities, though. The Biltmore house contains 175,000 square feet, divided into 250 rooms. Thirty-five are guest rooms and forty-three are bathrooms. When visiting, you must use public restrooms in another structure. So, take care of details before entering the house. We didn’t allow time to get down to the basement which houses the servants quarters, the swimming pool and the engineering spaces. When the house was constructed, the electric power world had not matured, with Thomas Edison and George Westinghouse fighting for supremacy between Edison’s Direct Current standard, and Westinghouse and Tesla’s Alternating Current. The Biltmore House was therefore wired for AC and DC. The first electric service was a DC generator in the basement. When an AC generating plant was built in Asheville, the Biltmore’s DC generator was changed out for a bank of mercury vapor rectifiers to change the city’s AC to DC for the house. When you tour the extravagant rooms of the Biltmore House, you cannot but help to compare it to the house in Downton Abbey. George Vanderbilt had provided not only comfortable rooms for guests, but he also provided three kitchens to feed them, libraries for reading and intellectual pursuits, stables to care for polo and carriage horses, an indoor swimming pool, and numerous gardens and walking paths to keep those guests entertained. The house itself is a beautiful structure, and from almost any part of the house you have breathtaking views of the North Carolina mountains. The designer of the house was Richard Morris Hunt, an architect of note who had designed several of the Vanderbilt houses. The grounds were designed by Frederick Law Olmsted who numbered the landscape design of New York City’s Central Park among his successes. 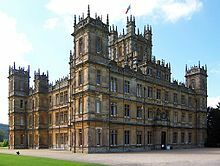 Similar to the story in Downton Abbey, I could not help but be struck by the sheer extravagance of the two houses, and the wastefulness represented by those estates of the very rich. Indeed, the Vanderbilt houses in America represent what has become known as the guilded age. We may think that the American guilded age and the lavish British Victorian age are long gone, but the very rich are still with us. Similar to lottery winners, even the Vanderbilts ran the risk of running out of wealth because of their extravagant ways. The estate is still owned by the family, but is operated as a business. Since it is in private hands, I don’t know how well the business performs, but you can see everything for about $50.00, US currency. Or, you can buy a pass good for one year and unlimited visits for $130.00. Equestrian activities cost more. Okay, several people have told to watch this series. I am convinced I need to start from the beginning and watch it. I love British TV so this would be an excellent adventure for me. As for the Biltmore House, I have always wanted to visit. I have two friends that live near there, but they are male. Leticia, I am sure your male friends would be glad to entertain you :), but your husband might have other ideas. Touring the Biltmore is a great experience, and I advise buying the tickets online a few weeks before you travel. We are fortunate that we have friends in the Asheville area. We had a lot of fun, and you will never forget the tour. It’s great to hear from you. Keep your blogging going. I have fun reading and commenting. Yeah, one of my male friends, whom was actually an ex-boyfriend when I was 17/18. Said he would be happy to take me and boys, and they hubby couldn’t say, “NO!” Fast enough! LOL!! But I would truly love to take my time walking through that place. It’s so lovely. Okay…Reader’s Digest version because I’m tired of trying……….I loved Downton Abbey but I and all my girlfriends are SO turned off by the last awful event that we may not continue..seriously..HORRIBLE!!! I’d love to go to Asheville AND the Biltmore Estate. I don’t watch Downton Abbey. But the Biltmore House? I’ve been there several times. A glorious place, IMO. Seeing the place with any thoroughness requires at least two days. We are in our second viewing of the series. Since I am a Prime Amazon customer, we get a lot of streaming video free on their service. Plus, every video I buy will be stored in their cloud. Since we are about out of Downton episodes, we have started on “The Tudors”, a series starting with King Henry VII. It is also an historically fascinating series. This is what retired people do. We watch TV, rehash events, and cackle together like kids. We do plan to go back to Asheville to visit the Biltmore House, again. We have friends in the area that we like to see. Plus, it is only a couple of hours from Atlanta. Life is good!